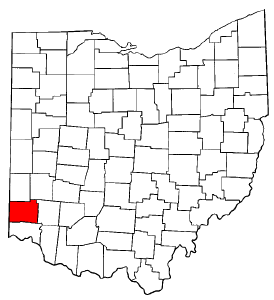 When Ohio Was The "Wild West"
William H. Harsha Lake map, East Fork of the Little Miami River, Clermont Co.
Monroe was half-way between Dayton and Cincinnati, and was a principle stage stop. Voorhes and Rucker owned the lines. Oxford had several taverns, houses, and bars for travelers, some of whom went on to Bath Springs or Brookville, IN. Waynesville: historic houses on the Accommodation Line, which connected Cincinnati with the National Road (old route 40) at Springfield. Corwin: the Accomodation Line followed the western ridge of the Little Miami River. This Franklin-Trenton Road followed an old Indian trail. This stage line was eventually replaced with the Little Miami Railroad, which ran through Corwin in Warren County. Stagecoaches and big freight wagons replaced the keelboat, so in 1815 Mike Fink moved further west. for the Butler County OHGenWeb resources page and the History of the American West transportation page.